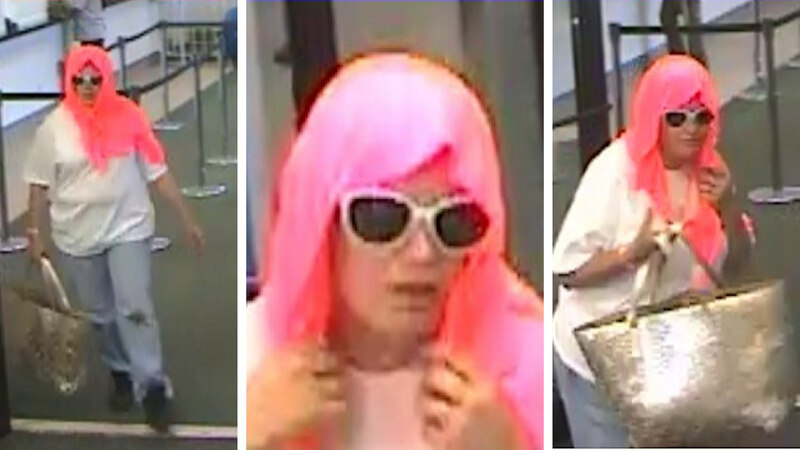 BRENTWOOD, New York (WABC) -- Suffolk County Police are on the lookout for a woman who robbed a bank in Brentwood on Wednesday. Cops say that the woman entered a Citibank at 710 Suffolk Avenue at approximately 1:45 p.m. and approached a teller with a note that demanded cash. The teller surrendered the demanded money and the suspect then immediately fled on foot. The suspect is described as a white female, approximately 5 feet 2 inches tall with a stocky build. She was seen wearing a pink scarf over the top of her head that draped down past her shoulders, white sunglasses, a white t-shirt, faded blue jeans, and several rings on her hand. The suspect was also seen carrying an over-sized light-colored tote bag. Anyone with information on this robbery is asked to call Crime Stoppers at 1-800-220-TIPS.